Crystal Hsu at Taipei Times reports on this exciting new endorsement of basic income. 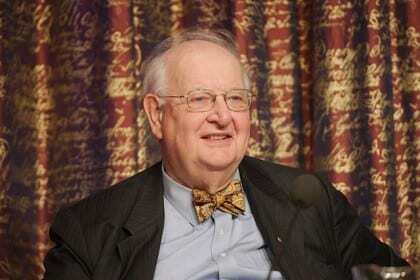 Angus Deaton is the Dwight D. Eisenhower Professor of Economics and International Affairs at Princeton University. Among other distinctions, he is a member of the American Philosophical Society and the National Academy of Sciences, a Fellow of the American Academy of Arts and Sciences, and a corresponding Fellow of the British Academy. Deaton’s current research examines measurements of poverty and the determinants of health in rich and poor countries. His Nobel Prize was awarded for work on consumption, poverty and welfare. Within the past year, other Nobel-winning economists have also announced their support of basic income, including Christopher Pissarides, Joseph Stiglitz, and James Mirrlees. Image: Angus Deaton at press conference in Dec 2015; Holger Motzkau, via Wikimedia Commons. The Nobel family has asked you to not refer to the banker’s prize as “Nobel”. You would not refer to a pair of jeans made with no connection to the company as Levi’s. as anything but counterfeit. Please lose the double standard. Thanks.